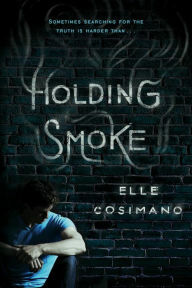 I read Holding Smoke for two reasons: 1) I like teen fantasy, and 2) I like realism about teens in difficult situations. The second one is a bit of a stretch, since fantasy and realism are generally considered opposites, but I had high hopes for the realistic setting of this book because the author was the daughter of a prison warden. As far as realistic settings go, Cosimano did a fantastic job. She managed to show the type of anger and violence that occur in a prison, without making it unsuitable for teens. She also wrote likable main characters with flaws. I’m always interested in reading what teen books say about prison, since I think it is important for teens to realize that “this could be you under different circumstances.” No, I don’t think of every teen as a potential prisoner so much as every prisoner as a human being with a story. This book did a good job of showing that John was a human being first, and a prisoner second. Of course, the realism had to stop somewhere – it is, above all, a fantasy novel. I enjoyed the fantasy/romance side of the story, too. In fact, it’s the unique prison setting that makes this such a good fantasy story. Also unlike most teen fantasies these days, it’s about a male character – making it appeal to kids of both genders. Recommended for teens 12 and up. You raise a good point. How can fantasy be realistic? I find that I skilled writer can manage this balance. Sometimes the fantasy elements can enhance the the realism. Great post as always Rachel. It sounds like the author was able to balance the fantasy and realism quite well. I read YA fiction from time to time, definitely preferring when it's fantasy. Some fantasy novels can have a lot of realism, especially when put in a serious setting. You're right about fantasy elements enhancing the realism this is especially true with writers like Gabriel Garcia Marquez. I quite unashamedly read a lot of YA. Though I tend to avoid the Twilight knockoffs – not that I'm dissing Twilight, or anything. To each their own. But I get tired of love triangles. I'm not sure this would be a good fit for me – I don't like reading about kids or teens in tough situations – but it sounds fascinating anyway. “Also unlike most teen fantasies these days, it's about a male character – making it appeal to kids of both genders.” < - I hate that this seems to be the way cultural pressures have shaped reading preferences. A book about female characters should appeal to both genders just as much as a book about male characters. Sadly, I don't think you're wrong though.